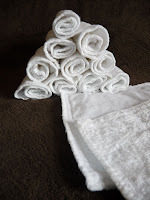 FIVE uses for Cloth Wipes besides wiping baby's behind! To use cloth wipes or not to use them?? Ah, the grand question every mama asks herself once she feels confident in cloth diapering her baby. To help you make your choice (and to encourage you to come over to the ever so fluffy side…) I’ve compiled a top five list of ways you can use your cloth wipes other than wiping your baby’s behind. A softer and greener way to wipe those messy noses during cold and flu season. Certainly if a cloth wipes is soft enough for your baby’s sensitive skin then it’s also sensitive enough for their chapped noses and lips. Clean your house with the wipes. Add a little water and vinegar to a spray bottle and get to those dirty mirrors, counters and windows. For a natural dusting solution on varnished wood simply use a few drops of lemon oil in a spray bottle with ½ cup of warm water, spray onto the wipe and wipe away. For unvarnished wood you can mix two teaspoons each of olive oil and lemon juice together and add to the wipe, then wring the wipe out to distribute the solution into the cloth. Wipe away using wide strokes so the oil goes on the wood evenly. Bathtime fun! Most cloth wipes are made out of natural fibers which means that those tough to get clean areas are protected because you’re using a natural material. Kitchen face cloth. I don’t know about you but I like to have a separate wash cloth on hand to wipe my kids’ faces after meal or snack time. I have purchased wash cloths from retail stores and after two years of heavy wear and tear they have bit the dust. My cloth wipes on the other hand are still going strong and are so soft on my son’s eczema prone skin! Use them as a protective liner when your baby has diaper rash. You cannot use a diaper rash cream on a cloth diaper unless it is made for use with cloth diapers. You can, however, repurpose your cloth wipes to protect your diaper from the non-cloth friendly oils. You have to wash these cloths separately from your diapers as you will not want for the oils to invade the entire load of diapers. I hope if you’ve been on the fence about cloth wipes this little list will have helped entice you to give it a try. You’re already using cloth diapers so you might as well go all the way in, right? Right! Elizabeth (aka Bert) Anderson married her college sweetheart in 2005, and started her journey into motherhood in 2008 with the birth of her son. She started blogging in 2009 as a way to keep track of her thoughts on being a first time mom, especially her struggle with postpartum depression, and as a way of reaching out to other moms who are struggling with the same things. This July, Bert had another first in her motherhood travels - a little girl! Even though she's newly a mother of two, Bert maintains that no matter how many children you have you will always be a "first time mom" because there's a first time for everything! Visit her blog, at FTM. Bert is a contributor for She Thinks Media. Definitely for noses...so much better than anything else!! I hope to eventually get cloth wipes though and use cloth instead of paper towels! I found some great cloth wipes (made by Rearz), bought a few bundles, and keep them in just about every corner of the house. They've been soooo useful to me. And the colors are pretty awesome too!